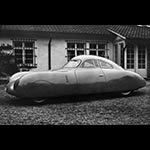 The influence and achievements of founder Ferdinand Porsche (b. 1875) stretch back to the early years of motoring. In 1898, Ferdinand Porsche presented the ‘Egger-Lohner electric vehicle, C.2 Phaeton model’, known as the ‘P1’ for short. The ‘P1’ – was one of the first vehicles registered in Austria, taking to the streets of Vienna for the first time on 26 June 1898. Designed and built by Ferdinand Porsche, he engraved the code ‘P1’ (standing for Porsche number 1on to all of the key components, giving the electric vehicle its unofficial name. 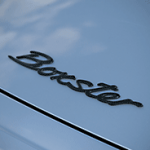 The first car to wear the Porsche badge was the Type 356, which started production in 1950. The origins of the 356 (and rear-engined Porsche sports cars) can be linked to three racing coupe’s developed for the long-distance Berlin to Rome race in 1939. The cars were codenamed Type 64 and based on the Type 60, better known as the original Volkswagen Beetle, also designed by Ferdinand Porsche. Since then Porsche has made a name for itself on the road and the racetrack. The enduring appeal of their 911 has seen production of over 820,000 911’s (and counting) over 7 model generations and in 2013 the 911 celebrated 50 years of production. Their road cars are renowned for excellent build quality and continual improvement and development. Testament to this is that over 70% of the road cars Porsche have built are still on the road. The first Porsche cars didn’t wear the famous crest, but simply had ‘Porsche’ written in capital letters across the bonnet. 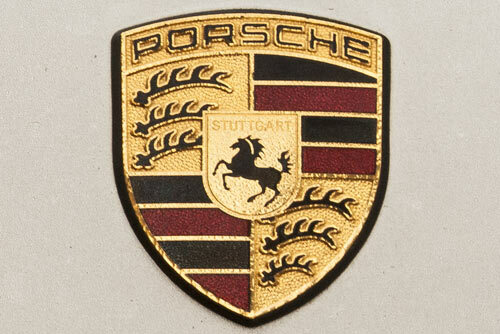 Legend has it, in 1952, US Porsche importer Max Hoffman suggested to Ferry Porsche over lunch that his cars needed a badge of there own and that Dr Porsche responded by sketching the crest on his napkin. Amazingly, the design has remained, with subtle changes, largely unchanged for over 60 years. The badge itself is made up of several elements. The black and red stripes with the curving Stag Horns, is the crest of Baden Württemberg, the German federal state where Porsche is based, in the city Stuttgart. The name originates from Stuot garten – stud garden or stud farm. Horses were bred in the region for around 1000 years, hence the rampant horse in the very centre of the crest. 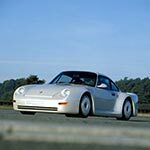 In motorsport Porsche has won races and championships at almost every level, having clocked up over 30,000 race victories in worldwide motor sports series. Porsche is the most successful manufacturer in Le Mans history, holding a record number of overall victories. Porsche cars have won the Daytona 24 hours 22 times, the Le Mans 24 hour race 17 times, the Targa Florio 11 times and the Monte Carlo Rally 4 times.